As a lady's maid, Margery Mallon knows that entanglements with gentlemen of the ton are taboo. But when Henry Ward, otherwise known as Lord Wardeaux, appears in her life, the possibilities of a scandalous affair are suddenly endless. Henry has another goal in mind though - reuniting Margery with her grandfather, and her rightful inheritance by any means possible - even if it involves seduction and deception. I’ve always drawn comfort from reading historical romances. 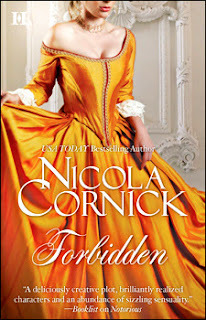 Forbidden drew me back into the world of Regency England, complete with lords and ladies, heirs and heiresses, and, of course, dashing heroes, quirky heroines and their romantic escapades. When you read romances as often as I do, it’s fairly certain that plotlines are going to be very similar to one another. What truly makes a story stand out is if it has characters that you fall in love with or elements (like a pirate ship, or being a spy) that provide an element of surprise. Unfortunately for me, this was not the case with Forbidden. I did enjoy reading about Margery and Henry; their romance was sweet. However, this book felt fairly typical, what with the Cinderella plotline, the stubborn yet intelligent heroine and the brooding, proud hero with a heart of gold. I liked it, but I didn’t love it. When reading adult contemporary romances, I get fairly bored unless I find something interesting about the story or character. 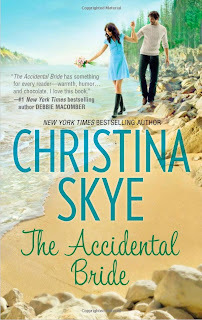 I really liked Jilly and Walker, and I enjoyed their romance in The Accidental Bride. The summary on Goodreads is very misleading. While everything does happen (in a way), it happens much later on in the novel than I expected. I appreciated that because it allowed for a little bit of build-up in the relationship between Jilly and Walker. It plays out like a typical romance novel, but I enjoyed it nonetheless. Other things I loved about this novel: Jilly’s lifelong friendships, the beautiful setting, Walker’s adorable dog and the people at the resort. There was definitely a small-town vibe going on in this book, which I loved since I’m from a fairly small town in the Philippines. As far as romances go, The Accidental Bride is a pretty decent contender. Totally agree with you on the historical romances - they can get a little formulaic and if the characters don't stand out, they're really pretty dull. The Accidental Bride sounds cute! I don't read many contemporary romances, but may have to try this one sometime! The Accidental Bride looks really cute! These sound great. I want to start reading contemporary romance novels, they seem to be really popular. Bummer that they weren't truly satisfying. But thanks for taking 2 for the team & giving us the down-lo. Huh, I'm glad you liked FORBIDDEN but can see how the story is somewhat typical, especially with the Cinderella theme and what not. I actually really enjoy when a story builds into a romance. It makes it all that much more realistic. Must check out The Accidental Bride. I love your Adult recommendations! I have added this along with the first book to my TBR list and hopefully one day I will be able to read them!